Trees can be easily grown through rooting the cuttings of the desired tree or from seed. Fruit trees are mostly grown from rooted cuttings, because growing from seed doesn’t usually produce the desired characteristics for the fruit. Choose what to grow by first exploring your area and identifying the hardiest species – maybe you can get the cuttings or seed from them. The cuttings are called scion wood, and it should be cut from the whip-like growth on superior quality trees, often found in the tops of the trees. It’s recommended to cut scion wood in the winter when the parent tree is dormant, and one-year-old wood is preferable. You can also grow rootstock from seeds or buy the rootstock and clone it – take a cutting and root it. Buying a bundle of bare rootstock can be cheap, and, depending on how much you buy, can cost as little as $1 a stem. There are various types of nursery you can set up at home, ranging from a small 5 gallon bucket, to nursery boxes, to a standard setup in containers and nursery beds. You can also plant directly on the site where you want the tree. If you want to start with seeds you could use the ‘5 gallon technique’ from Mark Shepard. He puts around 50 chestnuts or 75 hazelnuts per bucket, covers them with a couple of centimetres of soil, puts thick layer of mulch and waits for them to sprout. This can also be done by making seed pits in the ground. With seed pits you till the ground, mulch, and overwinter the seeds. Once the seedlings sprout you can transplant them into pots or upscale the bucket technique to a nursery box or beds. For large seeds (nuts), Mark Shepard uses a sandbox frame with hardware cloth on the bottom, fills it with soil and then puts a hardware cloth covered sandbox on top. 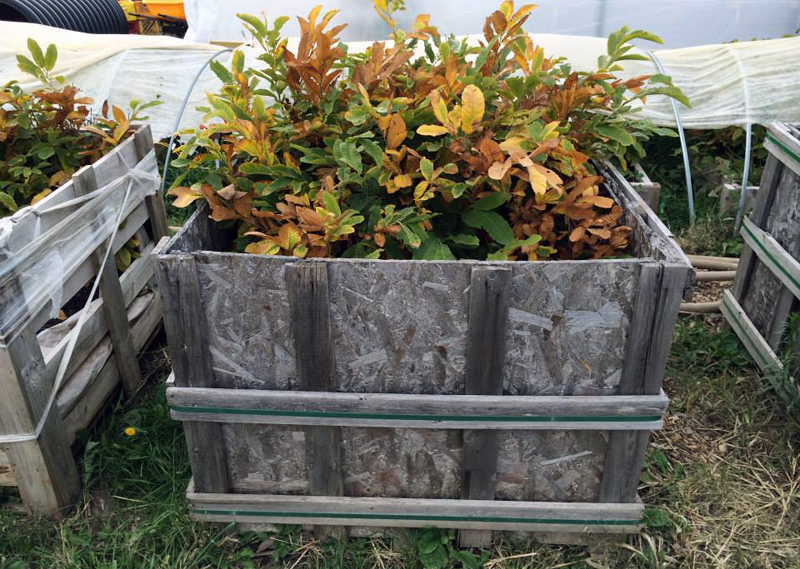 Grant Shultz from Versaland uses a similar technique, growing his chestnuts in palletized boxes shown in the picture above. These are fairly similar to garden beds, loose and deep with rich wood chip mulch. Seed, transplants and cuttings can go into the beds. Wood mulch can be used to create a fungal environment and make the soil alive, whereby symbiotic fungal organisms aid the growth and resilience of the trees. Beds can be planted really densely, with rows 30 centimeters apart, half an acre can contain up to 4,000 trees. Check out this interview for more info. This is where it can get a little bit more technical. Standard nurseries are designed to produce large numbers of trees and have a high efficiency per square metre of production. This can, however, be replicated on a small scale using a setup where the beds are above ground level, preferably at hip height so it’s easy to manage and that the plants are protected from diseases from the ground below. The trees are looked after in containers, using a mix of compost and perlite, or alternatively sand mixed with dried moss. In this way you can care for huge amounts of trees in one location, up to 500 trees per bed. This setup only refers to one bed, but that module that can be replicated over and over, on any scale. Therefore, in one 6m x 3m area you can have 4 beds with up to 2,000 trees. There are many advantages of planting directly on-site rather than transplanting as there is no shock or root damage and the tree develops a great root system with a deep tap root, adapting to the soil and climatic conditions. Mark Shepard directly seeds oak, butternut, black walnut and hickories. After a year in the field, he’ll graft the very tops but leave a branch of the seedling rootstock to grow out the side. American Horticultural Society Plant Propagation guide is a great resource for more information. Mike McGroarty’s website and this short video also share some useful tips. San Van Aken an artist from Seattle grew “The Mother of all trees” which bears 40 different types of fruit. An interesting read about it is in this article: http://www.1millionwomen.com.au/blog/tree-40-fruits/.